RAYMONDVILLE — For more than three years, this farming community has been counting on the reopening of a prison that was once one of its biggest revenue streams. Now, Management and Training Corp., the owner of the facility, is announcing it is closer to finalizing a contract to hold inmates at the site of the former 3,000-bed Willacy County Correctional Center. The area is still reeling from the so-called “tent-city’s” closer in 2015, which slashed one-third of the county’s budget while leading to 400 employee layoffs. Raymondville Mayor Gilbert Gonzales said MTC is planning to open a detention center expected to create 50 to 75 jobs. For Willacy County, the proposed 1,000-bed detention center would also pump about $1 million a year into its coffers. However, MTC spokesman Issa Arnita declined to disclose details. Arnita said he could not disclose the number of jobs that could be created. “The number of staff depends on the final contract, which is not yet finalized,” he stated. Arnita stated MTC is taking job applications through 5 p.m. Saturday. “Salary will be competitive with similar jobs in the area,” Arnita stated. Meanwhile, Gonzales said a job fair will be held Tuesday at the city’s L.E. Franks Tourist Center at 501 S. Seventh St. in Raymondville. 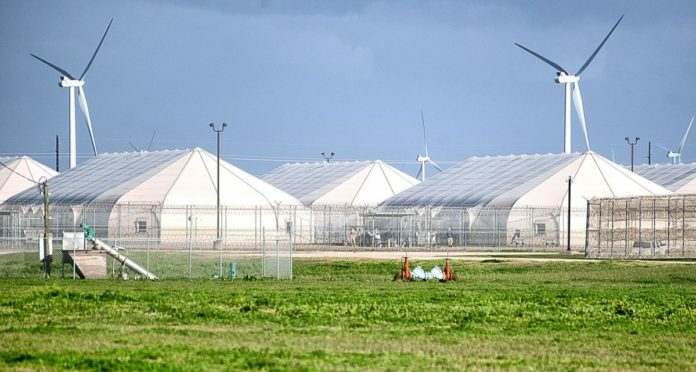 MTC is apparently closer to entering into a contract with U.S. Immigration and Customs Enforcement to hold about 900 inmates in a 1,000-bed concrete housing unit at the 53-acre site of the old tent-city prison, Gonzales said. “A contract is not yet finalized so we are unable to talk about the potential customer and their needs for this facility,” Arnita stated. Last year, the county sold the former 3,000-bed prison property to MTC after bond holders demanded payment of a $68 million debt. As part of the sale, an agreement will pay the county $3 a day for every inmate held in the facility. With a daily head-count of 900 inmates, the county would receive about $985,000 a year, calculations show. In Willacy County, the closure of the 3,000-bed “tent-city” prison, which paid the county for every inmate it held, slashed one-third of the county’s $8.1 million general fund budget, plunging the area into financial crisis. In February 2015, rioting inmates destroyed much the minimum-security prison largely made up of 10 Kevlar tent-like domes before the Federal Bureau of Prisons terminated MTC’s contract to hold inmates there. The prison’s closure led to the layoffs of 400 employees, who were paid some of the highest wages in the area. Ever since then, county officials have worked with MTC to land a contract to fill the old prison site and create jobs in this farming area struggling with high unemployment.